You’ve bypassed the cameras, slipped past the guards and now you’re ready to steal the treasure. But wait, what’s that? Another thief is muscling in on your Caper. Not tonight Boyo, those treasures are mine! Who said there’s honor among thieves? Collectors and Capers is the first offering by Blue Heron Games, on Kickstarter now. The goal of Collectors and Capers, like most games, is to have the most points at the end of game play. You gain points by stealing treasures from the museum and your fellow thieves. Before we get into mechanics or game play let me tell you a little about the cards. There are a few different types of cards in Collectors and Capers. The most important of these is the six “Steal This” cards that represent the treasure in the Museum. They are The Golden Fleece, The Priceless Painting, The Digital Guide, The Ancient Statue, The Holy Chalice and The Crystal Femur. Quite an eclectic mix, probably one of those avant-garde museums. Next is the “Heist” cards, these cards depict the various treasures in the museum. You will use the Heist cards to make sets to steal the treasures. Nestled in the crooked bosom of the Heist deck are also three different types of actions you can perform. No thief worth their salt wouldn’t do a little recon before a job. You can Case the Joint which will allow you to draw three cards from the Heist deck and keep one. For those of you with light fingers you can Pick Pocket, taking two random cards from another thief, keeping one and returning the other to your opponent. If you’re really good you can Spy on the Competition. This will allow you to look at another players hand or face down cards. It’ll make sense in a few minutes just go with me here. Finally you have “Secret” cards. No, not roll on deodorant or that you didn’t tell your boss about that extra long lunch the other day. These “Secret” cards also correspond to the treasures in the museum. I’m sensing a theme here…. For a 3-4 player game remove all cards from each deck that have the key icon. Place the six (five) Steal This (treasure) cards face up in the center of the table, this represents the museum. 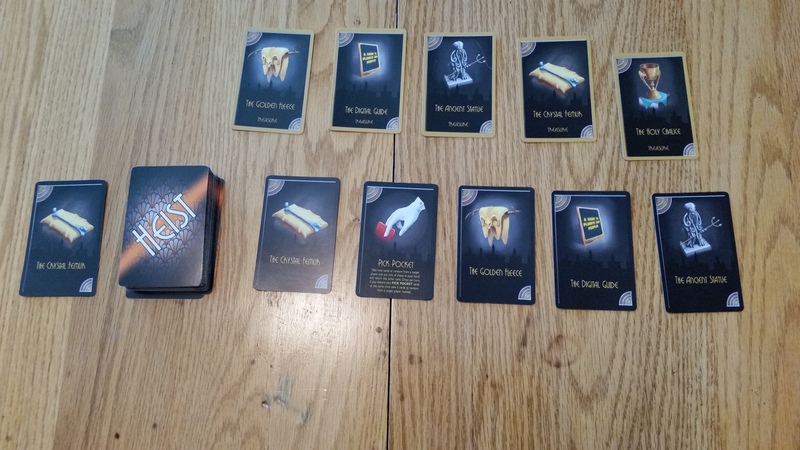 Deal one of each of the different Secret cards to each player. Each thief chooses one Secret as their primary objective and one Secret as their secondary objective. If you are in control of treasures that match your Secret cards at the end of the game you score more points. Now deal each player three Heist cards, this will be your starting hand. Finally deal out 5 additional Heist cards face up on the table underneath the museum, these are the informants. If three matching cards are dealt then discard all five informants and redraw. Now we’re ready to play! Every player has two Heist Points to use on their turn. This is your action economy and it’s not subject to inflation. You may use one Heist Point to draw a card from the Heist deck or take a card from the informants. If you take an informant card then replace it with the top card from the Heist deck. Playing one of your dastardly action cards will also cost you one Heist Point (twirls mustache with a menacing glare). If you have a set that is not currently controlling a treasure you can use a Heist Point to play cards on that set and finally you can exchange one of your Secret cards for one Heist Point as well. Wait what about stealing? I’m getting to it cool your jets, it’s all about the journey. Right? Ok for two Heist Points you can try to steal a treasure. Happy now? Alright you decided to steal and spent your two Heist Points. You declare which treasure you are stealing, either from the museum or another player and then lay down a set of at least three cards. A set is your wager against stealing a treasure. You can either play an honest set, where all the cards in your set match the treasure you’re attempting to steal or a dishonest set where not all of the cards in your set match the treasure. If stealing from another player you must play more cards than the set that currently controls the treasure. Not so fast buster, after you make your declaration of intended thievery the other players may now attempt to challenge you. Players may bet one or more cards from their hand if they feel the thief is being dishonest. They do so by placing the card(s) face down on the table in front of them. If the number of cards bet by the other players is equal to or exceeds the number of cards in the set trying to steal the treasure the thief is challenged. DUN DUN DUN……. Also if each player bets at least one card the thief is also challenged. What happens if you don’t have any cards? Easy you can bet cards from your sets that aren’t currently controlling a treasure. You’ve always been known as the shifty type so you’re being challenged. Your friends wouldn’t trust you as far as they could throw you. What are you gonna do? You could start by turning over a new leaf, I mean who wants to be friends with someone like that, I mean really. But…. I digress. Once you are challenged you have to reveal the set you are using to steal the treasure. If you were honest after all (look at you being all smug) then the players who bet against you discard the cards they bet. If you were dishonest (I knew it!) any cards you played that don’t match the treasure you were attempting to steal are discarded and the cards the others players bet go back in their hands. If you were attempting to steal the treasure from another player and the two sets are of equal size then both players must reveal their cards. Any cards that don’t match the treasure are discarded. The player with the largest remaining set controls the treasure and in the event of a tie the player who had control initially maintains control. Once cards have been revealed they remain face up on the table regardless of whether or not they control a treasure. Once a treasure is stolen place the treasure card on top of the set that was used to claim it. This treasure is now controlled by the set. You may not add cards to a set that already controls a treasure. You may only add cards to non-controlling sets. If you weren’t challenged on your turn, you’re a lucky S.O.B. I tell you what. Oh, it also means that the set you used to steal the treasure stays face down on the table, vexing the other players until someone finally tries to steal it away from you. At the end of your turn if you have more the 7 cards in your hand then discard back down to seven and stop being so stingy. If the Heist Deck runs out then reshuffle the discard pile and keep right on playing. When the last treasure has been stolen from the Museum it triggers the end of the game. Starting with the player who stole the last treasure there are just three rounds of play left. After the third round scoring begins. For every Steal This treasure card that matches your Secret card you get 8 points. If you control a Steal This card and it doesn’t match either of your Secret cards it’s ok, you still get 5 points. By some weird twist of fate you wind up controlling a Steal This card with a dishonest set you get 4 points and for each set not controlling a Steal This card you get a measly two points. I guess it better than nothing, right? That, in a nutshell is Collectors and Capers. Collectors and Capers is a fun, light strategy game for 3-6 players, ages 12 and up. Depending on the number of players, how many Capers your game consists of and how cutthroat your players are will determine the length of your game. Basic game play though, will only take you about a half an hour. This is a solid beer and pretzels game with quick game play and easy to understand mechanics. I like the bluff and challenge mechanic, it’s simple and seamless during play. 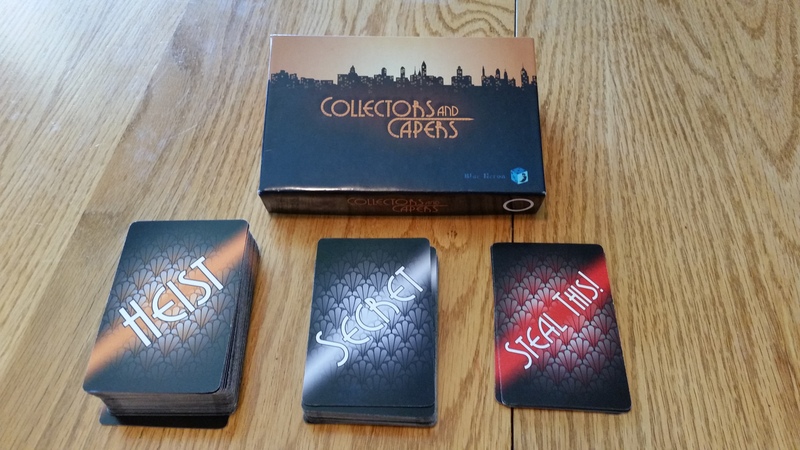 Collectors and Capers would be a welcome addition to any game night. It has all of the things that I look for in a game, quick to learn, easy to play, fun, portable and fast game play. The time is right and there’s treasures to steal, it will take all of your luck and skill to pull it off, are you up to the challenge?